Shred Wise Inc. provides Fullerton, California, with the best value in paper shredding services. We offer both on-site and off-site document destruction services at competitive rates with exceptional customer service. Our paper shredding services are compliant with local, state, and federal law, and everyone on our staff is extremely knowledgeable in all aspects of document destruction. We’ve served thousands of satisfied residential and commercial clients over the last eight years, and are confident that we can provide you with a cost-effective shredding solution that meets your needs. We guarantee that your confidential documents will be 100% destroyed and recycled. We issue a “Certificate of Destruction” with every shredding job. Our Fullerton clients are always welcome to witness their documents being destroyed. We are a locally-based shredding company that offers flexible service at a great price. We can help businesses in Fullerton comply with HIPAA, FACTA, Gramm-Leach-Bliley, and other privacy laws. We are NAID (National Association for Information Destruction) compliant. We require no long-term commitment or auto-renewal stipulations for regularly scheduled shredding services. 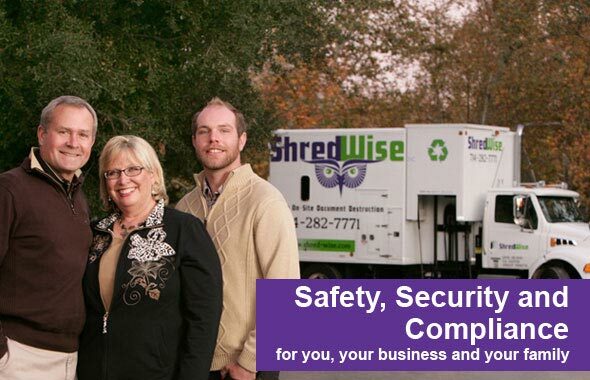 Shred Wise’s mobile shredding services in Fullerton can benefit both individuals and families as well as businesses of all sizes and from every industry. Our clients include doctors, financial planners, hospitals, medical billers, real estate companies, mortgage companies, schools, banks, municipalities, police and fire departments, libraries, aerospace companies, attorneys, CPAs, veterinary clinics, animal hospitals, retailers, restaurants, and more. We are able to help this diverse range of clients keep their private information safe by offering secure, customizable document destruction services at very competitive prices. Shred Wise can shred any number of paper documents and files for our Fullerton clients. This could range from as little as a few boxes of documents to hundreds of pounds of paper. In order to make shredding as convenient as possible, you can bring your documents to us seven days a week or we can bring our shred truck to you and shred your documents on site. You won’t have to remove staples or paper clips, and can even keep them in their file folders. This makes it easy to destroy financial reports, tax records, bank statements, medical records, classified information, consumer data, credit applications, employee records, invoices, contracts, blueprints, receipts, checks, and more. In addition to paper documents, we also accept a variety of storage media, such as CDs, DVDs, and hard drives. The only items we cannot shred with your paper are plastics, metals, and anything with film. Call today to learn more. 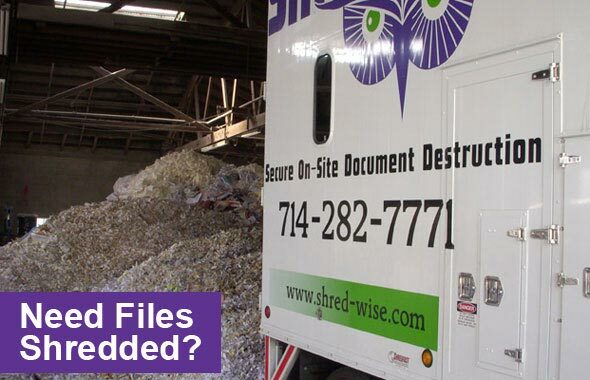 Shred Wise has been providing on-site or mobile shredding services to Fullerton since 2006. This service involves us bringing our shred truck to your site, picking up all the paper you need destroyed, and immediately shredding it. We always invite our clients to witness the shredding process themselves, and issue a Certificate of Destruction once the job is complete. For added security, we provide our ongoing clients with locked consoles and shred bins to store and transport their sensitive documents in accordance with current privacy laws. Then, at the end of the day, we take all of the shredded paper to a secure facility to be recycled. Call today for a free quote on our on-site/mobile shredding services in Fullerton. Our mobile shredding services in Fullerton can be requested as needed or set up for recurring service at regular intervals. As-needed shredding services are ideal for one-time purges. Recurring or ongoing scheduled shredding services are for those who frequently work with or produce documents with sensitive information. We can visit your business on a bi-monthly, monthly, bi-weekly, weekly, or even daily basis, and provide you with as many locked shred containers as you need, at no additional cost. Our ongoing, scheduled shredding services are designed to be very flexible, so that can readily meet the changing needs of our Fullerton commercial clients. This means that we are happy to work with you if you need to change the frequency of our shred visits, require an extra visit before your next scheduled service, or want to suspend or cancel service due to last-minute changes with your business. In addition to our mobile shredding services, we can also arrange secure and cost-effective off-site shredding for clients in Fullerton. Off-site shredding usually involves us picking up your boxes and/or shred bins and transporting them in a locked panel truck to our facility in Orange for shredding. This is typically a service that is requested by our clients in Fullerton who need a large volume of paper shredded all at once. Similarly, you can bring smaller quantities of paper directly to us and we’ll shred them for you at a very affordable rate. In both cases, we provide you with the opportunity to watch your documents getting shredded and issue a Certificate of Destruction when we are done. Call today to learn more about off-site shredding services for Fullerton, California. 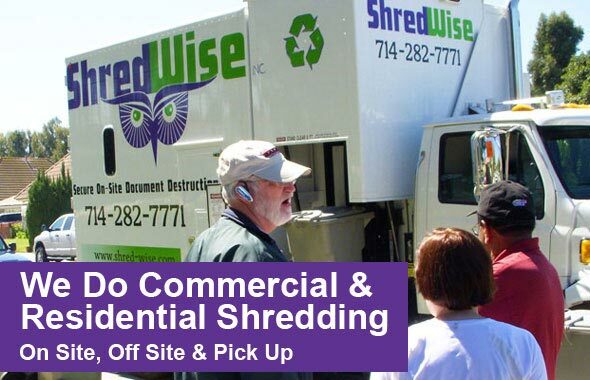 In order to comply with current privacy legislation and protect the sensitive information of our customers in Fullerton, Shred Wise uses the latest shredding trucks and equipment available today. Our shred trucks can shred up to 6,000 lbs of paper an hour, and is fully automated for greater efficiency and security. They employ a pierce and shred technique for extremely effective destruction with minimal dust, which means a reduced fire hazard, and use a compaction ram that mixes the shredded paper with hundreds of pounds of other paper that’s in the storage area, thus greatly diluting it and making it virtually impossible to piece them back together. To help our regularly scheduled clients keep their documents secure in between shredding visits, we are happy to provide free locked bins and consoles. These containers meet the strict requirements of HIPAA, FACTA, and GLBA, and promote adherence to proper management of sensitive data. Our rolling shred bins can hold up to 200 pounds (or approximately six to seven file boxes) of paper at a time. Our secure console is 35″ tall and 19″ by 19″ square; it features a slot to receive paper while remaining locked. It can hold up to 100 pounds (or approximately three file boxes) of paper. Call today to learn more.